Gold nanoparticles that have functional surfaces and act on osteogenic differentiation of stem cells have been successfully developed by Tissue Regeneration Materials Unit at the International Center for Materials Nanoarchitectonics (MANA). This research result had been published online version of journal Biomaterials. In regenerative medicine, the technology to control stem cell functions such as differentiation and proliferation is indispensable. It the past, researches have showed that nanosized gold particles promote the differentiation of human mesenchymal stem cells into osteoblasts. Other studies suggested that various functional groups such as amino, carboxyl and hydroxyl groups can promote or inhibit stem cell differentiation. Inspired by those reports and the team started this project to test their assumption that gold nanoparticles with surface modified with functional groups could be a promising candidate to control stem cell functions. The researchers synthesized gold nanoparticles with surface modified with three functional groups: a positively-charged amino group (-NH2), a negatively-charged carboxyl group (-COOH) or a neutral hydroxyl group (-OH), and identified how they affect the osteogenic differentiation of mesenchymal stem cells that were derived from human bone marrow. Results showes that among these three types of nanoparticles, those with the carboxyl groups were uptaken by cells and exhibited a strong bone differentiation-inhibitory effect. In the following research, they investigated the effect of gold nanoparticles with carboxyl groups on the gene expression profile of mesenchymal stem cell from human bone marrow. The results demonstrated that the nanoparticles could inhibit several gene expressions related to osteogenic differentiation. And the influence of the gold nanoparticles on promoting or inhibiting osteogenic differentiation varied depending on the types of functional groups. In regenerative medicine, it is crucial to develop technology enabling controlling stem cell functions as well as their safety and high-quality. In the present study, researchers attempted to control stem cell functions through material manipulation, and their findings contribute a lot to the creation of novel nanomaterials that facilitate the advancement of stem cell manipulation. It is expected that based on these results , more breakthrough discoveries and technology will be made in developing regenerative medicine. What’s the Role of Microglia Cells in the Aged Brain? Microglia cells are the primary immune cells of the central neuron system（CNS). They are the brain counterpart of macrophages and are known as the defender of the brain. Although they are neuroprotective in the young brain, microglia cells have also been found to react abnormally to stimuli in the aged brain and to become neurotoxic and destructive during neurodegeneration. Aging-induced immune senescence with microglia senescence in the brain causes microglia to function abnormally and promote neurodegeneration. Microglia senescence includes morphological changes and alterations in immunophenotypic expression and inflammatory profile, usually caused by microinvironmental factors. The hypothesis of microglia senescence during aging give a novel perspective on their roles in aging-related neurodegeneration. Many scientists believe that aberrant inflammatory responses play a role in the etiology of several neurodegenerative diseases, such as Parkinson's disease or Alzheimer's disease, in which aging is the most important risk factor. The CNS is relatively immune-privileged and major immune-cell antigens can be detected on microglia. Therefore, microglia cells have been considered to represent the brain's internal immune system. It is concluded that any changes in microglial activities during aging are key components in influencing the pathogenesis of neurodegeneration. Microglia normally keep in a quiescent state, thus sometimes called resting microglia, with ramified morphology and weak expression of function-associated antigens. When triggered by appropriate stimulation, microglia rapidly become activated with deramified shape and enhanced antigen presentation. As an active sensor and monitor in the brain, microglia are neuroprotective. However, uncontrolled response of microglia may be dangerous to the survival of injured neurons or even cause damage to healthy neurons. In the normal aged monkey brain, microglial expression of MHC class II increases with age, and the phagocytic activity of microglia increases age-dependently. Immunohistochemical studies also reveal that microglial activation is age-related. Additionally, from activated microglia explanted from aged mice model, the increased pro-inflammatory cytokines and decreased anti-inflammatory cytokines have been demonstrated, which also suggests the abnormal immune state of microglia in the aged brain. All of the facts suggests that the inflammatory state of microglia in the aged brain primes them to be over-responsive to small stimuli and so the activation of microglia in the aged brain loses control. However, it still remain uncertain what triggers the microglial activation in the healthy aged brain. Creative Bioarray is the world’s largest primary cells supplier. The company offers 35 human cell systems with over 160 different cell types and also provide primary cells from over 13 types of other animals. We offer both rat microglia cells and human microglia cells for research use. Generally, stem cells are cells that have the capability to become any type of cell in the body. They have the ability to self-renew or multiply while retaining the ability to develop into other types of cells, such as cells of the blood, heart, bones, skin, muscles, brain etc. Though there are different sources of stem cells, all types of stem cells share the same capacity to develop into multiple types of cells. Stem cells are categorized by their potential to differentiate into other types of cells. Embryonic stem cells are the most powerful stem cells because they can become every type of cell in the body. These cells have the ability to differentiate into all possible cell types. Examples are the zygote formed at egg fertilization and the first few cells that result from the division of the zygote. Pluripotent stem cells can differentiate into almost all cell types. Examples include embryonic stem cells and cells that are derived from the mesoderm, endoderm, and ectoderm germ layers that are formed in the beginning stages of embryonic stem cell differentiation. Multipotent stem cell have the ability to differentiate into a closely related family of cells. Examples include hematopoietic (adult) stem cells that can become red and white blood cells or platelets. This kind of stem cells can differentiate into a few cells. Examples include (adult) lymphoid or myeloid stem cells. This type of cells can only produce cells of their own type, but have the property of self-renewal required to be labeled a stem cell. Examples include (adult) muscle stem cells. Stem cells have become the very common research topic in labs. Creative Bioarray offers over 1,000 stem cell products including adult stem cells, tumor stem cells, embryonic stem cells, iPS cells and other stem cells. Immunohistochemistry is based on the principle of antibodies binding specifically to antigens in biological tissues to detect the antigens in cells of a tissue section. 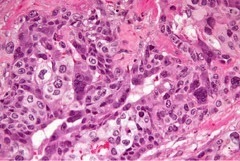 It is a process used to diagnose some types of cancer including mesothelioma. The procedure involves locating antigens in biopsy tissue through the use of a visual marker. The cellular events associated with cancerous tumors will be highlighted by the stained tissue sample. Besides, immunohistochemistry can also distinguish whether or not a tumor is benign or malignant. The principle of IHC was uncovered in the 1930s and about ten years later the first IHC study was reported. Since then, with improvement and development of protein conjugation, enzyme labels have been introduced, such as peroxidase and alkaline phosphatase. Later colloidal gold label, radioactive elements were introduced and the immunoreaction could be visualized by autoradiography. Now immunohistochemistry has become a routine and essential tool in diagnostic and research laboratories. Immunohistochemistry (IHC) analysis is a method for demonstrating the presence and location of proteins in tissue sections. This method is believed less sensitive quantitatively than immunoassays such as western blotting or ELISA, but it has advantage that it enables the observation of processes in the context of intact tissue. This is especially useful for assessing the progression and treatment of diseases such as cancer. Immunohistochemical staining is accomplished with antibodies that recognize the target protein. The antibody-antigen interaction will be visualized using either chromogenic detection or fluorescent detection. Direct Method：Direct method is one step staining method, and involves a labeled antibody (i.e. FITC conjugated antiserum) reacting directly with the antigen in tissue sections. Indirect Method：Indirect method involves an unlabeled primary antibody (first layer) which react with tissue antigen, and a labeled secondary antibody (second layer) react with primary antibody. PAP Method (peroxidase anti-peroxidase method): PAP method is a further development of the indirect technique and it involves a third layer which is a rabbit antibody to peroxidase, coupled with peroxidase to make a very stable peroxidase anti-peroxidase complex. Avidin-Biotin Complex (ABC) Method: ABC method is standard IHC method and one of widely used technique for immunhistochemical. Labeled StreptAvidin Biotin (LSAB) Method：A recent report suggests that LSAB method is about 5 to 10 times more sensitive than standard ABC method. Jurkat cells are an immortalized line of T lymphocyte cells that can be used to study acute T cell leukemia, T cell signaling, and the expression of various chemokine receptors susceptible to viral entry, particularly HIV. Those cells are very useful in science because of their ability to produce interleukin 2. Their primary use is to determine the mechanism of differential susceptibility of cancers to drugs and radiation. The Jurkat cell line was firstly established in the late 1970s from the peripheral blood of a 14 year old boy with T cell leukemia. Now different derivatives of the Jurkat cell line can be obtained from cell culture banks that have been mutated to lack certain genes. l Co-immunoprecipitation analysis revealed the presence of endogenous TAL1/E2A complexes in Jurkat cells, a leukemic line derived from a T-ALL patient. l FR-alpha expression in Jurkat cells facilitated MBG or EBO entry, and FR-blocking reagents inhibited infection by MBG or EBO. l To explore the potential of human IL-16 for gene therapy, this portion was transfected into HIV-1-susceptible CD4+ jurkat cells by means of a mammalian expression vector. l FADD/MORT1- and caspase-8-deficient Jurkat cells expressing only TRAIL-R2 were resistant to TRAIL-induced apoptosis. l Transfection of thymidine kinase-chloramphenicol acetyltransferase constructs containing the 21-bp c-myc sequence into Jurkat cellsdemonstrated increased chloramphenicol acetyltransferase activity upon phorbol ester and phytohemagglutinin treatment. l A cell permeant peptide derived from this sequence displaces cytochrome c from IP3R and abrogates cell death induced by staurosporine treatment of HeLa cells and Fas ligand stimulation of Jurkat cells. l The gene encoding human interleukin-2 (IL-2) has been cloned from human spleen cells, peripheral blood lymphocytes, and the Jurkat cell line . l Isolated melanosomes express FasL, as detected by Western blot and cytofluorimetry, and they can exert Fas-mediated apoptosis in Jurkat cells. l Overexpression of wild-type 14-3-3 tau also inhibited phorbol ester-induced PKC theta translocation from the cytosol to the membrane inJurkat cells, while a membrane-targeted form of 14-3-3 tau caused increased localization of PKC theta in the particulate fraction in unstimulated cells. l Studies in which p56lck associates with PLC gamma 1 as a result of TCR stimulation of Jurkat cells, suggesting that p56lck plays a central role in coupling the TCR to the activation of PLC gamma 1.
l A caspase 8-deficient subline (JB6) of human Jurkat cells can be killed by the oligomerization of Fas-associated protein with death domain (FADD). l CD95L resistant myeloma cells were found to be sensitive to TRAIL, displaying apoptotic features similar to those of the CD95L- and TRAIL-sensitive T leukemia cells Jurkat. l VLA-4 on Jurkat cells is of constitutively high avidity and interfered with migration across barriers expressing VCAM-1. l Using immunoblotting and immune complex PLC assays, CD3 stimulation of Jurkat cells can induce the association ofPLC gamma 1 enzyme with CD3 complex. l Northern blot analysis indicated the expression of human PEBP2 alpha A, alpha B (AML1), and beta genes in Jurkat cells. l The cytotoxicity of neutrophil-derived TRAIL against Jurkat cells was determined by flow cytometry using FITC-conjugated annexin. l Immunoblot analyses demonstrated that TCR ligation dramatically increased the level of tyrosine-phosphorylated PLC-gamma 1 present in anti-Tyr(P) antibody immunoprecipitates from stimulated Jurkat cells. l Nuclear cAMP-responsive element (CRE) binding activity in electrophoretic mobility shift assays was constitutive in unstimulated Jurkat cells, showing only a small increase upon Tat treatment. When to Use Primary Cells and When to Use Cell Lines? First, we need to understand the difference between primary cells and cell lines.Primary cells are cells straight taken from tissues with no passages. Cell lines are cells which are immortalized , representing similar features of primary cells. A cell line has at least one passage. To put in a simple way, cell lines are easy to work with and immortal, which means one can have them forever. Scientific community tends to considered cell lines as standard for certain researches in the past. Although , cell lines do not represent all proprieties occurring in vivo, but its convenience for use has been proved by many labs. Primary cells are the ideal tools for research , but they also have many limitations. They are not well characterized, with a limited life span, slow in proliferation. Frustratingly, the use of primary cells can arouse ethical issues as these cells are directly taken from animals or human bodies. Moreover, with every passage, the characteristics of primary cells change. Therefore, for consistency of results from experiment to experiment and from year to year, cell lines would be preferable , but the premise is that they are handled properly. However, in vitro studies on cell line showed that cells reveal continuous changes through passages due to the effect of in vitro culture condition. Freezing down of cells for storage reasons affects the cell population which kill some subclone and allows other to overgrow. Some scholars believed that primary cell culture is more suitable for use to simulate the in-vivo condition. As a matter of fact, ex-vivo culture is more closer to body real condition than working on line cells. Therefore primary culture is advisable for they can give more relevant and accurate results especially in studies in vivo. Besides, primary cells are useful for other studies from cell differentiation, co-cultures, ECM studies and so on. What’s more , now there are many biotech companies, say Creative Bioarray , offering primary cells ,which can help to save lab time and cost. Both cells have its own advantages and disadvantages, and the choice of using what kind of cell lines should based on the factors such as the type of research, time, cost and etc.Once taking those factor in consideration , you will understand what will be the right choice for your research. The MS-5 cell is one kind of murine stromal cells, generated by irradiation of adherent cells in long-term bone marrow cultures. It was first established in 1989. MS-5 stromal cells are known to support the growth of hematopoietic stem cells and other cell types. MS-5 cells can produce extracellular matrix proteins. The cells produce GM-CSF, and high quantities of IL6 and SCF. They also express HGF and the receptor and elaborate an activity that behaves like IL3. Research has proved that MS 5 cells support the growth of hematopoietic stem cells and granulocyte-macrophage colony-forming cells and moreover, conditioned medium of MS-5 cells can stimulate colony formation of granulocytes from murine bone marrow cells in semi-solid culture. MS-5 cells support expansion of early human hematopoietic progenitor cells without need of exogenous growth factors . The expansion of primitive hematopoietic progenitor cells (HPC) need to be stimulated by growth factors and therefore, for many years the expansion of primitive hematopoietic progenitor cells remain to be a very challenging and complicated process. But recently researches use MS-5 cells to explore the role of stromal cell coculture for maintenance of progenitor/stem cell potentia and the research show the generation of GF producing murine stromal cells such as MS-5 cells can efficiently support expansion of early hematopoiesis without the adding extra GF. Creative Bioarray maintains various human and animal cell lines that are invaluable for medical, scientific and pharmaceutical institutions and consistently attains the highest standards and uses the most reliable procedures to verify every cell line. The company provide MS-5 cells and MS-5 cell line established by irradiation of the adherent cells in long-term bone marrow cultures derived from C3H/HeNSlc strain mice. The MS-5 cells and MS-5 cell line are well preserved and are well suited for research use. Creative Bioarray. Travel theme. Powered by Blogger.